Illustration by Jordan Whitney Martin. For having no brain, I admit, you are wise. But I can’t tell if you are yummy. No offense. It must be really frustrating to be hunted down, dried, then fried and finally — heaven forbid — eaten. This is why I kind of understand when you revengefully go all toxic and dangerous and so easily get your venom flowing into our human body with a simple touch. I wouldn’t like to lie deep fried in a plate accompanying a glass of wine, either! But please, tell your friends the sea wasps there’s no need to drive people to their poisoning, agonizing death in a few seconds just because they can. I know you guys need a gangster squad, too. But trust me, dear jelly, scaring people off is more than enough. We need the beach and we need the swimming and we need the surfing, too. Nothing good ever comes from war. You know you’re better than this. 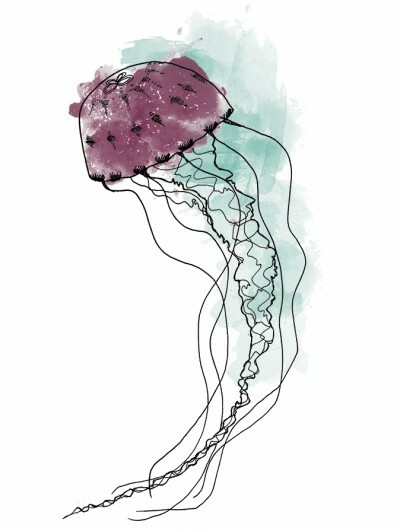 Traveling the seven seas, feeling the waves carry you away, swimming along with hundreds or thousands of brothers and sisters in jellyfish blooms sounds like a dream life to me. Why not stick to that? I wonder if you ever take a moment to think of all the things you have. Being so transparent makes you nearly invisible. I know many of us would love to be able to do that sometimes, too. Can’t you use your invisibility to find inner peace and quiet? Take a tiny moment to just stand still and observe the world without being seen yourself. In the super stressful, high-speed era we are living in, you could make a living by teaching that kind of thing, jelly-friend. You’d be an expert because you know how to live life at your own pace. Using your little umbrella-shaped bell pulsating for locomotion. In this day and age! Plus you are phenomenal to observe when you float. You can get people hypnotized. Goldfish got nothing compared to you. You are your own sparkly disco ball lighting up and rotating as you please, performing any disco move ever imagined. Floating around for 500 years without bones, brain or even blood in your system, you dance your heart out in swirls, even though you don’t literally have one! Well, what’s wrong with having no heart? You’ve got the style, baby! And you’ve got your ways of twisting and turning on your own into the world’s oceans. Only you could be pink or purple or turquoise or bright orange or even crystal clear if you fancy. Plus you have your own special way to reproduce which is not one really, but … two? Both sexually and asexually? Seriously, in what kind of evolutionary state are you, jelly? What is this, outer space? How do you even call this thing you do with your babies, first releasing the sperm into the water, then fertilizing your girl without a single touch — a good or a bad thing, who am I to judge — and then letting the little egg go out into the clear, blue waters to grow and feed all by itself? No wonder it’s gonna turn out super independent just like yourself! We’ve all got so much to learn from you; if only we could be self illuminated. I’m sorry, friend, this is way too awesome. Some people think of you as a forbidden gourmet delicacy, but if that’s the way for humans to get some of your superpowers I might start considering it, too. You might as well think of it as revenge against your silent sting. And everyone knows that revenge is a dish best eaten cold. Jellies of different shapes and colors live at Shedd Aquarium, Chicago and they are waiting for you to visit in their “95% water, 100% amazing” exhibit, extended through 2013.